I saw this at the supermarket, so I splurged. It set me back $12.99. I had no idea MAD was still around. This entry was posted in MAD Magazine and tagged MAD Magazine by luckyotter. Bookmark the permalink. Hm…I have enough craziness in my house…. How old are you? It was really popular in the 60s and 70s. 19? Yeah, MAD was definitely past it’s prime when you came along. It was obviously still around, but not a thing anymore. Oh! worth a treasure to you, then! ok now its bedtime so, good night! 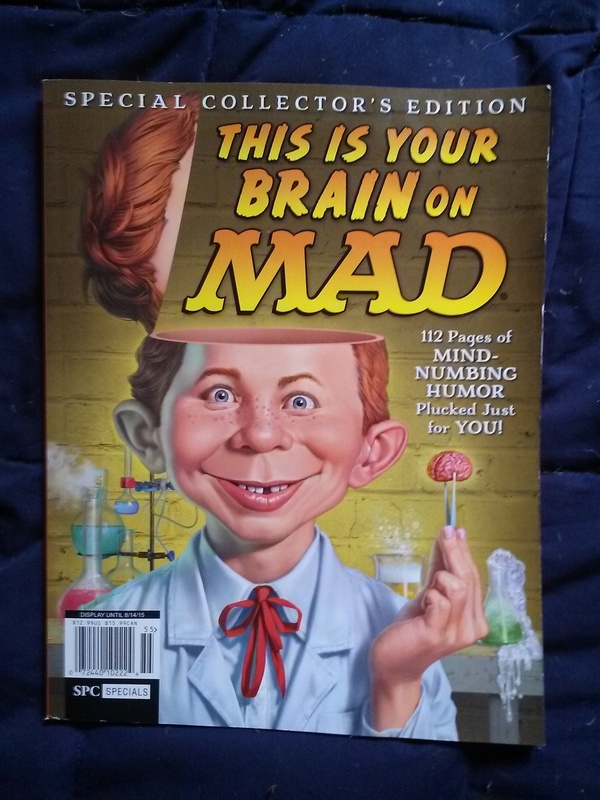 My older brother used to buy MAD magazine all the time when we were kids, but he usually kept them hidden in his room where our mom wouldn’t see them. I used to sneak in there and read them when he wasn’t around. MAD was awesme back in the day–60s and 70s. My mom didn’t want me to read it, but she conceded and decided it “wasn’t so bad” after she saw my copies of the National Lampoon, which was far more “offensive” and meant for older customers in their late teens and 20s, while MAD was always marketed to older children.